Toxicodendron radicans (flowers).M B. Gargiullo (ca. 2011). Toxicodendron radicans is a woody vine climbing to 15 m by aerial roots dark, hairy, twigs speckled with tiny, raised dots (lenticels); older stems thick, hairy, closely adhering to tree trunks, also forms ground cover; by extensive rhizomes, with erect stems about 30 cm tall or more; sap highly irritating (see below); winter buds gray-brown, pointed, naked (no scales), about as wide as twig, leaf scars V to U shaped with a peripheral ring of vein (bundle) scars (Harlow 1946). Toxicodendron radicans.ground cover.Tom Kent.Flora Finder.florafinder.com (Accessed 3/2017). Leaves alternate, 3-parted, to 40 cm long, leaflets, elliptic to egg-shaped, tip pointed, base blunt, surface shiny, margins entire to coarsely toothed to occasionally lobed, fall color yellow to red; leaves expand mid-May; winter plant leafless 160 days (Britton 1874). Dioecious. Flowers greenish-white, tiny in branched clusters, May (Britton 1874), pollinated by bees that collect nectar (honey made from poison ivy nectar is not toxic); flowers strongly reflect ultraviolet light which attracts insects. Pollinators include; European honey bees (Apis mellifera), Agapostemon virescens (virescent green metallic bee, Halictidae), Augochlora paura (a green metallic bee, Halictidae), Andrena sp. (mining bees, Andrenidae) and Lasioglossum sp. (Milne and Milne 1980; Mulligan and Junkins 1977). 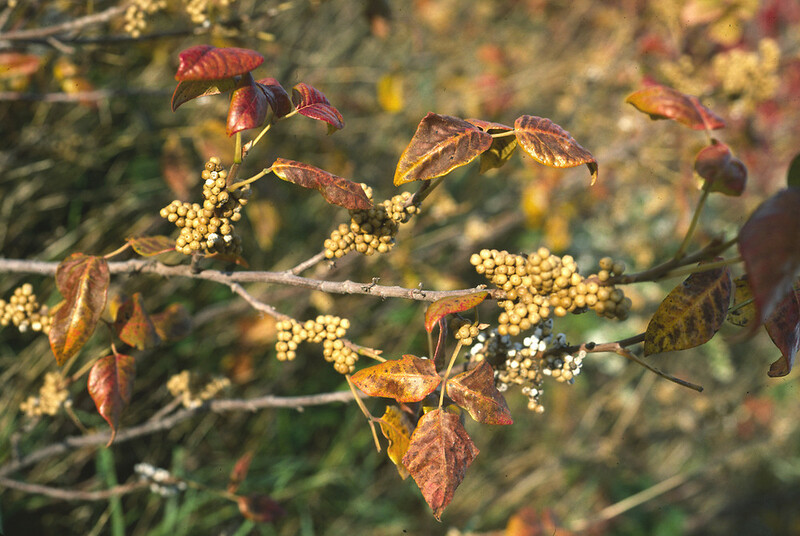 Toxicodendron radicans.fruit and autumn leaf color.John Lynch. Copyright © 2014 New England Wild flower Society.gobotany.newenglandwild.org. (Accessed 7/2014). Fruit gray-white, waxy, 1-seeded; Sept.-Nov. persistent through winter. Seed load 68%. Pulp nutrients: water 4%, lipid 47%, protein 2%, CHO 0% (White 1989). High lipid fruits eaten by many birds that disperse the seeds, esspecially woodpeckers and yellow-rumped warblers, which can assimilate saturated fats. Also used by crows as crop grist, which results in extensive seed dispersal (Place and Stiles 1992; E. Stiles personal communication). Dispersal to and establishment in new sites in successional forest, contiguous with old regrowth stands has been calculated at a rate of 1.64 m/yr (Matlack 1994). 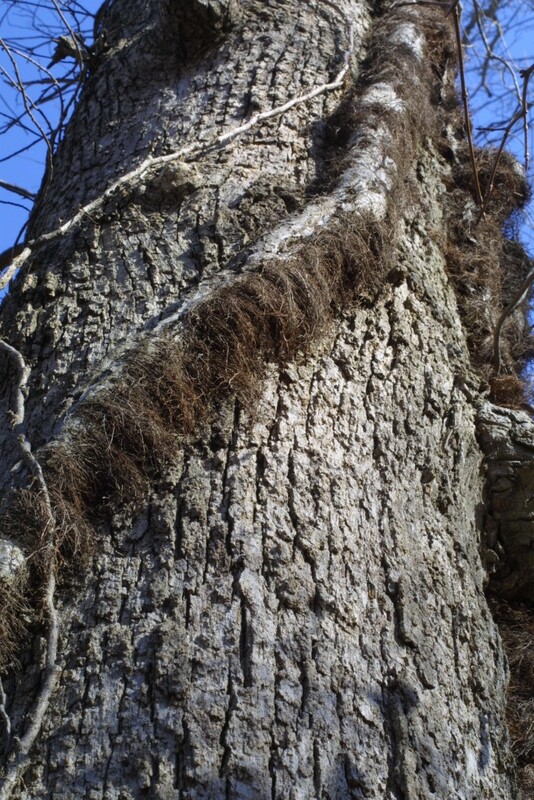 Toxicodendron radicans (aerial roots).Steven J. Baskauf.bioimages.vanderbilt.edu (All Accessed 7/2014). Habitat: Open woods, disturbed areas, swamp forest edges. Prefers soils high in calcium and magnesium. Tolerates acid soil down to pH 3.8. Found in soil pH 7 (Greller at al. 1990; Gargiullo unpublished data). May form shrub-like habit on beach back dunes. Twigs eaten by deer, muskrats, small rodents and rabbits. 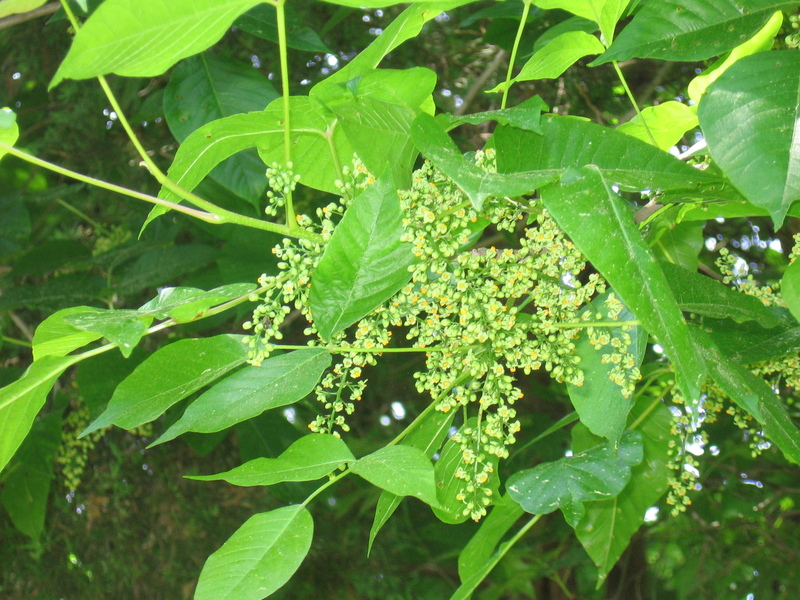 Notes: The irritant in poison ivy sap is composed of four catechols (1, 2 dihydroxybenzenes) with a 15 carbon side chain on carbon number three (Kingsbury 1964; Mulligan and Junkins 1977). Plants remain toxic during winter. Eaten upon by many insects in the orders Hymenoptera (sawflies), Diptera (flies), Coleoptera (beetles), Homoptera (Aphids), Acarina (mites), and Lepidoptera (moths). The most damaging of these may be the larvae of a pyralid moth Epipaschia zelleri. Larvae of moths in this family are often borers or leaf rollers (Covell 1984). Fungi that infect poison ivy include the leaf diseases Cercospora rhoina (Deuteromycotina, Hyphymycetes); Phyllosticta rhoicola, Sphaeropsis sumachi, Cylindrosporium irregulare and C. toxicodendri (Deuteromycotina, Coelomycetes). A rust, Pileolaria brevipes (Basidiomycotina), also infects poison ivy (Mulligan and Junkins 1977; Sinclair et al. 1987; Agrios 1988). 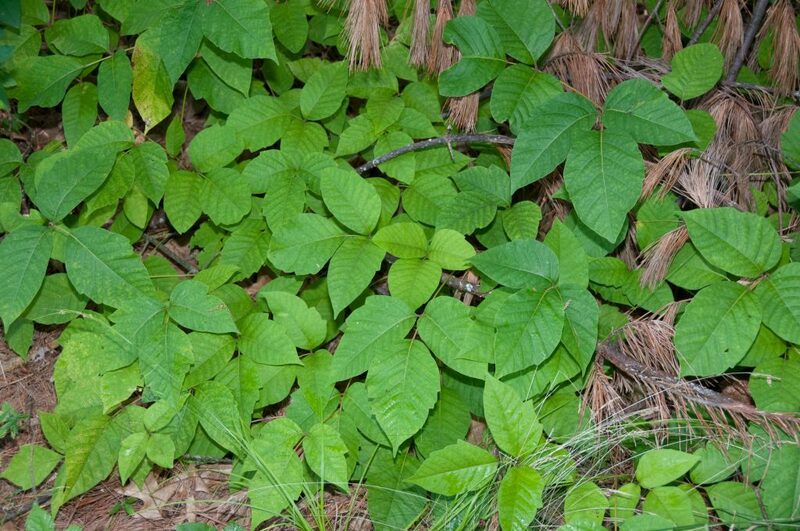 Poison ivy is an important ground cover and soil holding species on shady slopes and disturbed woodlands. It provides shelter for birds, small mammals and invertebrates.